Wow! I am still turning in circles at Michigan’s weather this winter, and now its spring! We have been very fortunate here this year. Our winter was very mild and ended in temperatures in the 70’s. I am absorbing every ounce of sunshine, as are my outside animals. I hope everyone is happy and healthy at your house. Well our little kitty that I found in the barn last year will be one year old on Good Friday. He is running the other two cats in our house ragged. He is actually kind of a bully! But I love him so much. What a sucker huh? Watusi has quickly become a favorite among the young adult set and the Baby Boomers. We hope you like it as much as we do. I am having fun going through scents to start pouring additions to the line for summer. 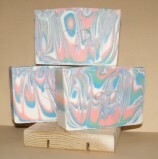 All of these soaps can be found in the catalog page under traditional soaps. If there is a soap we have carried in the past you would like to see again, please let me know. I recently had someone inquire about the multi apple fragranced soap we carried during the hiolidays, Forbidden Fruit. So I will be ordering that scent to carry again. I guess I had better get busy and quit banging away at this keyboard if I intend to make any soap this week. I sure hope all of you are enjoying your first day of spring. It is a wonderful thing when all of the new shoots start poking their little heads up through the soil, and absorb the sun and rain to grow strong and tall. It gives me a fresh new outlook on life as well. Apricot Kernel Oil is expressed from the seeds of apricots. It is produced from the kernels of the apricot pit. Apricot kernels are poisonous, but not once they have been roasted. It is very good for the skin. It is light oil rich in vitamins A, D & E and in both oleic acid and linoleic acid. Apricot Kernel Oil and Sweet Almond Oil are frequently used in cosmetics to soften the skin. Apricot Oil can also be used directly on the scalp to help improve its condition. It is suitable as a super fatting oil in solid soap and is used as an essential ingredient in making clear, cleansing liquid soaps. Apricot Kernel Oil is a yellow to golden carrier oil. It is widely used in lotions; creams, massage oils, soap making and lip care products. It is also used as carrier oil in some pharmaceuticals. It works great on mature or sensitive skin, and also for skin that is inflamed and dry. It has been said to aid in the repair of elasticity in aging skin, and is very moisturizing. It is also known to help retain the clarity, and suppleness of the skin. According to Press Release Log Website, it contains antioxidants that target and inhibit the cell damages of things like ultraviolet rays, smoke and other chemicals. Apricot Kernel Oil absorbs quickly, is light, non greasy and is moisturizing. Although it is higher in oleic means a more stable shelf life, it will oxidize as is normal for oil, and should be checked along with your other oils. Apricot Kernel Oil has a shelf life of 1 year. In conclusion, Most small time home soap makers such as myself save this particular oil for use specialty soaps, mainly because it is more expensive than most of the basic oils used in soap making. And I feel it is better used in a leave on products such as lotion, rather than a wash off product such as soap.